Written for a local German journal and published in 1811, these fabulous, funny, jewel-like miniature tales describe con men, tricksters, disasters, murders, rascals and lovers, and include Franz Kafka's favourite story. 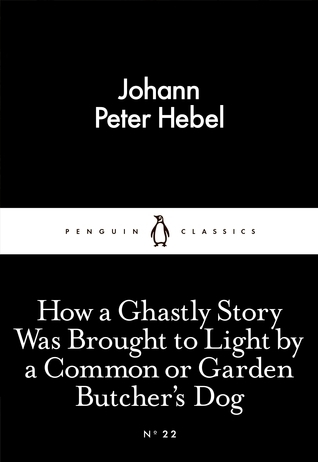 In this little collection of German folk tales, Hebel presents us with a number of shorter than short stories, and aims moralistic and karmic arrows at us in order to penetrate his point. Most of his tiny scenarios depict some sort of wrongdoing followed by some sort of comeuppance. The others are just simply peculiar and difficult to fathom. My favourite story was The Lightest Death Sentence in which a man is sentenced to death. Pitying him, and wishing to maintain his respect, the prince allows the man to choose his method of dying, whether by the wheel, hanging, guillotine, anything he'd like. The man chooses to die of old age. The stories all follow a similar pattern, and you know what's coming before it does. There was nothing outstanding for me here; these read as witty little stories a drunk old man would tell you in the pub - those which are enjoyable, and make their point at the time, but which are soon forgettable after the point's been made.